Logan Markland of Fort Macleod in action for Alberta at the national tournament last summer in B.C. 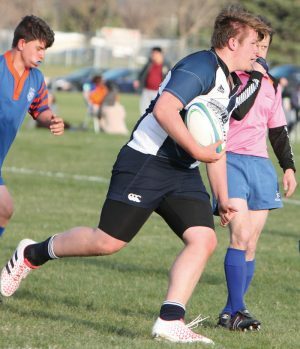 A Fort Macleod youth will represent Canada later this month at a U18 men’s rugby tournament at San Diego. Logan Markland, 16, will play for one of two Canadian teams in a tournament against two United States teams. The tournament is part of the selection process for the Canadian U18 men’s rugby team. “It’s just going to feel amazing to play for the country that I live in,” Markland said in advance of the tournament, which starts Wednesday, Dec. 26. Markland joins players from B.C., Ontario, Quebec, Saskatchewan, Nova Scotia, New Brunswick, Manitoba and Newfoundland on the Canadian roster. The six foot three, 250-pound prop is the only player from southern Alberta on the Canadian squad. Markland’s team will play three games against the other Canadian and two U.S. teams from Dec. 26 to Jan. 3. When they’re not playing they will be practicing, doing team-bonding activities and sightseeing. “I’m in the gym, I’m training, eating healthy,” Markland said of preparations for the tournament. Markland took up rugby in Grade 7, not out of a particular interest in the game but rather because friends were playing and it was a sport offered by F.P. Walshe school in Fort Macleod. 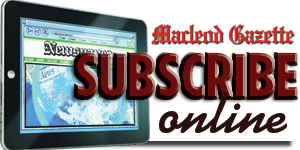 “I wasn’t really too keen on the sport,” Markland admitted. Under the tutelage of Flyers coach Craig Patton, however, Markland developed his skills and a strong love for rugby. “He’s played a big role in where I ended up today,” Markland said of his coach. The process of playing for Canada began last summer at an Edmonton tournament of high school all-star teams from across the province. Markland was one of a select group of players selected from that tournament for a chance to play on the provincial team. “When I heard that I made the team it was kind of lifting,” Markland said of making the U18 Alberta team. The Alberta team played in a national tournament in B.C. last summer where they placed second to win silver medals. It was Markland’s first exposure playing with an elite group of athletes and he noticed immediate differences from high school in terms of skill, speed and aggressive play. Markland also found the strong sense of camaraderie that is one of the hallmarks of rugby. From the national tournament, coaches selected another select group of players to try out for the Canadian team at a camp in Saskatoon. Before he could go running back to Saskatoon, Markland had some unfinished business on the gridiron. His high school team, Willow Creek Cobras in Claresholm, had a football game that Friday night. Markland who was having an all-star season at running back as well as starting at middle linebacker, played the football game and travelled through the night with his mother Corrallee to Saskatoon. Markland said it was a high point in his life when he got the word he was invited to try out for Canada, although a little intimidating. That feeling has since been topped by the invitation to play for Canada at the San Diego tournament. “Getting an invitation to play was one of the best feelings I’ve had in my life,” he said. Markland is excited to bring back his experiences playing for Alberta and Canada to his high school team.